Haley: One thing about me that may surprise people is that I love music – I would say much more interested in music than the average person. I talk about this later on, but I did experiment playing various instruments growing up, quickly realized I was better at sports so stuck with that, but have always been a huge music fan. I have been to probably over 50 live concerts, am frequently selected to be the locker room DJ, wish I was a real DJ, and love watching documentaries on various bands and musicians. I also saw Bohemian Rhapsody three times in the theaters – not sure if I should be proud of that, but it was truly an amazing movie and Queen is incredible. Adam: Looking back, what is your sharpest or most significant memory from your Olympic experience? 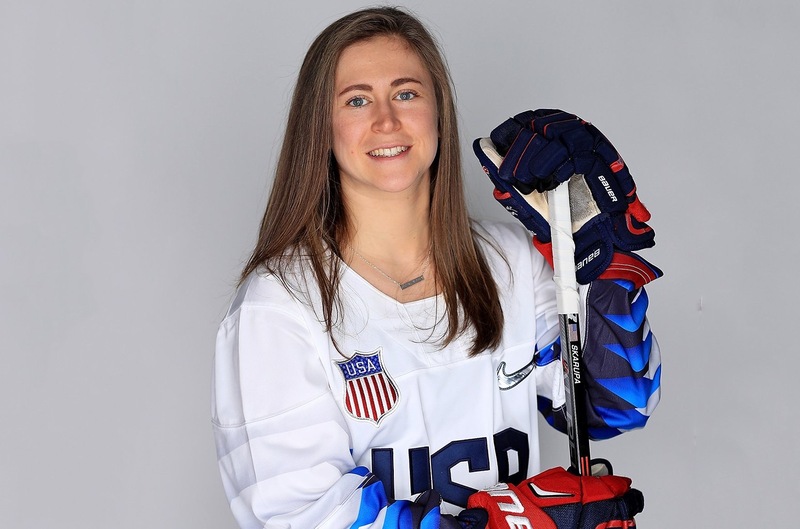 Haley: My sharpest, and most significant memory from the Olympics would probably be celebrating on the ice after we won with my teammates, friends and family. After all of the sacrifices my family made for me to follow my dreams, it was just so surreal to be able to share that moment with them. Hugging my teammates and singing the United States National Anthem as our flag rises above all of the others is also a memory that I’ll never forget. Haley: Something that would surprise people about the life of an Olympian is that the Olympics is not just every four years for us. There is this saying our team frequently keeps in mind… “the Olympics is not every four years, it is every single day”. And it’s true. While people tune in every four years (or two including the Summer Olympics) to watch some of the most incredible athletes in the world compete, keep in mind that their entire lives have led to this moment. They have woken up every morning relentlessly preparing. That being said, we are also very normal people who love to go to the movies and hang out with friends in our spare time. It’s all about balance. Haley: I could probably write a book on this question. It was not an easy path, certainly not a conventional one either. Everyone experiences setbacks and challenges along their journeys (injuries, losses, etc. ), but my biggest failure that was instrumental in my growth as not a hockey player, but a person, was that I was originally cut from the team. I did not make the Olympic Team and was sent home after the Trial Camp in 2017. I had taken the entire Spring and Summer completely away from the sport and had not played for 6 months before being asked back on a very unofficial and temporary try-out. That is where the real journey began of finding a role and doing whatever I could, on or off the ice, to make a difference. I found out I officially made the team 2 months before the Olympic Games began. Haley: The best lessons I have learned is to let go of the things you can’t control and lean on the ones who are there for you and the ones who will make you stronger. There are so many aspects in life that are out of our control. Throughout my journey, I learned it is not worth worrying about what I cannot change. Secondly, I would not have made it to where I am and would not be who I am without my family and without my teammates. They were there not just during the highest of highs, but also during the lowest of lows and that is the most important lesson I have learned – that surrounding yourself with a solid support system is what will push you through and to the top. And enjoy the journey. Because the results are not nearly as rewarding if you can’t look back on and smile about the journey. Haley: Confident. Humble. Leading by example. A lot of leaders like to talk the talk, but if they can walk the walk, that is when people will grab hold and follow. Having the confidence to do what is not just easy, but what is right and being humble enough to listen – that is what makes an effective leader. Haley: I think aspiring leaders can take their leadership to the next level by using everyone on the team and everyone involved. A team will buy into a leader when they feel they are contributing and making a difference. Making sure to utilize everyone and their roles, to me, is what leaders can do to elevate and expedite their success. Let go of your ego – once you learn it is not about you, that is when you’ll start to find success. Listen. Sometimes leaders get so caught up in leading a group, they forget to listen. Do what is right, not what is easy. It is not about pleasing everyone, it is about making those difficult decisions that are challenging in the moment, but pays off later on. Haley: I would not say it is necessarily advice, but one of my coaches growing up once told our team, “courage is not about being fearless. It is about feeling the fear and doing it anyway”. I think this is so powerful, because it is just so real. Everyone wants to be the hero and sometimes we can be in denial about our own fears and setbacks. But understanding our setbacks, instead of denying them, and then facing them is when an individual will truly grow. Stop fooling yourself, face the facts, and then move forward – it just so much more rewarding. I love that idea so much. Haley: I think one thing everyone should be doing is just simply consider how everyone is fighting their own battle. You never know what someone else is going through, so taking that approach every day will instantly change your perspective and change the way you engage with other people – friends, family or strangers. It is such a simple thought that can go a long way. Haley: I am a huge music person. Growing up, I played a little bit of the saxophone, guitar, and also tried the flute and piano. I wasn’t as good as I would have liked to be at those instruments, but really enjoyed them nonetheless. I cannot sing for the life of me, nor dance, but I love attending live concerts, my favorite music group is Mumford & Sons, and I am usually appointed as team DJ in the locker room. Music plays a large role in my life. I am also very into videography and film production. After I was initially cut from the Olympic Team, during my time away from hockey, I worked part time for a film and video production company in downtown Boston. I gained a huge appreciation for it and loved how I was able to express a moment, experience, or feeling through film. It really helped to take my mind off athletics and focus on something different for once. Haley: I think that just about covers it. Thank you!